Deutsche: "We Are Entering An Environment Where Everything Wants To Sell Off"
The market responded with confusion to last week's Fed statement, which initially was interpreted as more dovish than expected in anticipating only 2 more rate hikes in 2018 sending the S&P spiking, only for a more hawkish narrative to gradually take over, facilitating last week's violent selloff, as the market focus shifted to the hawkish path of tightening signaled by the Fed dots. Even here though, the dot plot was slightly steeper but hardly enough to cause sleepless nights, even as Jay Powell repeated that the Fed will remain data dependent. But perhaps the market was mostly taken aback by (lawyer) Powell's straight-to-the-point talking style, answering questions directly and efficiently, avoiding the coma-inducing verbal diarrhea that defined the press conferences of Janet Yellen (in fact, Powell's first presser set a record for shortest quarterly news conference by Fed chair), and generally eliminating much of the two-way confusion that markets had welcomed in the past, as it had provided a welcome buffer courtesy of Powell's predecessors saying so much fluff (and nothing of substance) that it paradoxically "justified" the market's every opinion (and resulted in such bizarre outcomes as record easy financial conditions amid several consecutive rate hikes). What does the Fed's changing narrative mean? According to Deutsche Bank, two things. First, in analyzing the market's response to the Fed statement, and especially the aggressive reaction in the rate vol space, Deutsche's resident semiotic and post-modernism analyst, Aleksandar Kocic - who has for the past year explained virtually every market move in the context of the bi-directional information pathway between the Fed and market, a trope he picked up by reading Lacan (the "mirror stage"), Derrida, Foucault and other pomos - who wrote that last week signaled a more hawkish Fed, "which suggests that monetary policy could become potentially disruptive for markets – after years for hyper-stimulative monetary policy, where everything used to rally, stimulus unwind is taking us into an environment where everything wants to sell off." While it is hardly news that the Fed is now in balance sheet roll-off mode, if only until stocks tumble at which point the Fed will resume easing, Kocic warns that this hawkish shift "is now happening at accelerated pace and along the way creating new pattern of vulnerability across the markets." What is the hierarchy of vulnerability in this context -- which market sectors are going to be the more vulnerable than the others? to be limited and orderly. The latter trade, financing equity vol with credit vol, is a complement of the credit view with high vulnerability of equities. Based on the last week’s finale, rising geopolitical risk and trade tariffs are only going to reinforce this hierarchy of vulnerability as well as provide support for bonds which, when coupled with a more hawkish Fed, could add more flattening bias. Here it's also worth noting that another, parallel shift is taking place in terms of the market's response to newsflow from the political arena (of which Donald Trump has made sure there is plenty). As Deutsche Bank has repeatedly commented for the past year, markets have learned to discount the effects of political volatility "and growing political entropy." Ironically, noisy politics "was interpreted as an obstacle to ability to produce consensus and legislate changes." In other words, political uncertainty became synonymous with status quo and, as such, remained bearish for market volatility. The paradox is that the more D.C. squabbled, and the more Trump got into hot water, the more traders and algos saw this as validation of the status quo. And while, to a large extent this still remains the case, "with the escalation of political risks new modes of market vulnerability are emerging at the intersection of politics and policy," according to Kocic. Translated into English, this means that - as last week showed - outbursts from Trump are once again shaking markets, especially when it comes to the developing "trade war" narrative. All this combined, pushes vol away from rates and into equities, and argues in favor of outperformance of equity vol over credit, "with a possibility that further escalation of political risk taking rates deeper into gamma bearish territory" as traders dump risky assets and buy such relative safe havens such as credit and duration (at least until China retaliates by announcing it will halt or sell TSYs). 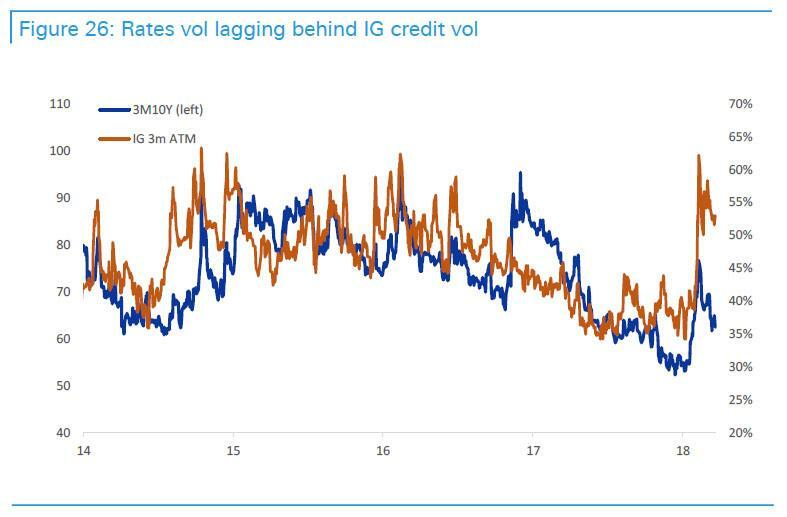 ... and the second looking at the repricing higher in equity vs credit vol. So should one just enter into a "crash" pair trade, of selling rates vol and buying equity vol? 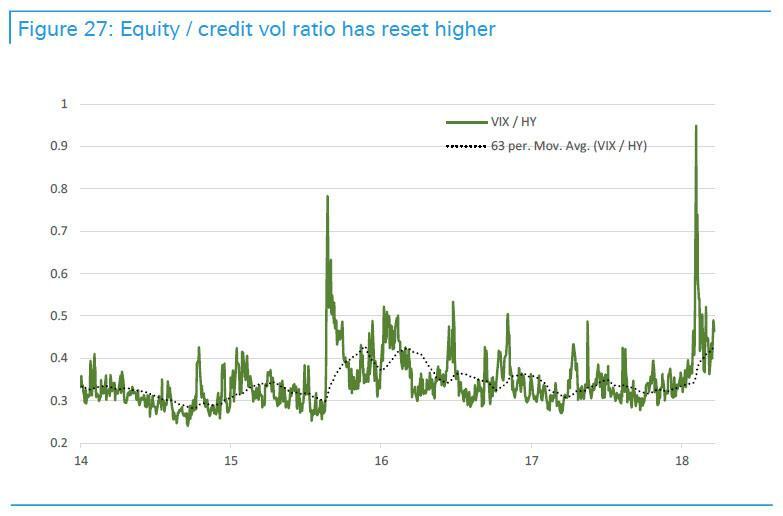 Sure, just be careful for a potential whiplash in credit vol: as Kocic concedes, while in the near term, an aggressive/hawkish Fed is seen more disruptive for risk than for rates or credit, "that could change in the long run" especially if China, that holder of $1.3TN in TSYs decides to send a powerful message to Trump as to who is really calling the shots in the incipient trade war. There is a second "narrative" to emerge as a result of last week's hawkish FOMC: as Deutsche explains, "last week’s FOMC meeting can also be interpreted as an attempt of the Fed to take control of the process of rates market normalization. This is the alternative narrative." This particular narrative is one of substantial latent risks, as until now, the Fed was willing to let market's dictate the normalization process, even if it means a dual paradoxical outcome whereby the tightening after several rate hikes lead to higher risk, while yields rose in the context of an acute, and recessionary, curve flattening. It is this nonsensical reaction to "normalization" that the Fed is hoping to "normalize" in turn, although in doing so it risks losing control of the entire process. As Kocic notes, for more than seven years after 2008, bear steepeners and bull flatteners were dominant modes of the curve -- while short end hardly moved, back end articulated response to market shocks. These two modes of curve response were effectively a referendum on success of stimulus. However, one should keep in mind that these two curve modes are highly unnatural. Normally, shocks arrive at the front end of the curve and, since rates are mean reverting, their effect attenuates with time making them less visible at the back end. This is why in normal times bull steepening and bear flattening represent dominant modes of the curve. In that context, bear steepeners and bull flatteners are a reflection of explosive rates dynamics (negative mean reversion) – front end shocks amplify with time. The explosive process does not present a problem as long as the front end is in a “sleeper” mode, but as soon as it starts moving – when rate hikes commence – the risk of the long end getting unhinged becomes a problem. 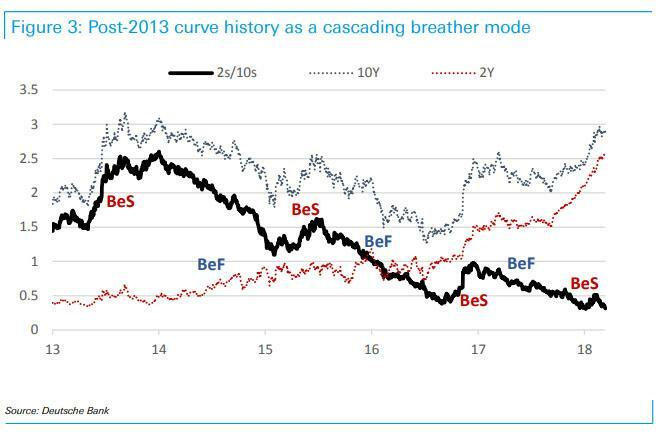 It is this curve "breathing", which directly impacts downstream risk assets, that the Fed has been trying to control since the beginning of rate hikes." As a consequence of this effort, "every violent bear steepener has been encountered with an appropriate response of the short end of the curve causing a gradual flattener in such a way to shift the action closer to the front end. This is the “breather” mode of the curve. Effectively this was an attempt to recalibrate rates market and remove the risk of “exploding” back end. As a result, with time the bear steepening eruptions became less volatile and more limited arguing in favor of Fed’s success in their effort. However, as a result of the changing narrative, and especially if indeed Powell wants to regain curve control over the recent resumption in flattening, the Fed risks jeopardizing its "credibility" of being able to control the curve. In any case, according to Kocic, what this boils down to is that the Fed continues to supply convexity to the market, albeit in different form then before (rates range during QE or transparency and dialogue with the market in the first two years of rate hikes). It is in this shift that "the risks are being flexed." In terms of market mechanics, this means that as monetary policy remains negatively convex to higher rates due to tail risk of the bond unwind trade, "the Fed’s supply of vol is effectively financed by increasing their negative convexity exposure." In practical terms, this means that in a dramatic regime change, one which we hinted at in February when we first relayed the new Fed chair's stunning philosophical admission that "the Fed has a short volatility position", Powell now appears to be abandoning the problem of facing the tail risk by being behind the curve and is instead pushing rates higher themselves, or as Kocic summarizes, "instead of risking that markets raise rates" - a process which can quickly spiral out of control - "are taking control of that process." And although locally vol could stabilize, stakes are getting higher with time and the question of whether the Fed would be able to successfully fine-tune its exit and take control of rates normalization without causing major disruption remains open. However, a few more big, sharp drops in the S&P and there will be no question what the market thinks of the Fed's sharp regime change, and its chances of successful execution, especially if what Deutsche said earlier on, namely that "stimulus unwind is taking us into an environment where everything wants to sell off" remains the case.